What if you could approach personal finance like most of us try cooking? Instead of learning a bunch of rules and principles, all you’d have to do is follow some tested recipes. Would this make it easier to save money, budget and build wealth? Today’s guest thought so and the result was a new approach to money management he called Cashflow Cookbook. Instead of asking you to make sacrifices to save money, he compiled 120 ideas for you to be more efficient with your spending, while not having to worry about making drastic lifestyle changes. I started to build this spreadsheet… How do you generate wealth, how do you save money to either pay down debt or put away for savings on things that require minimal sacrifice, minimal effort, are there more of them? And so that was a two year journey of building this massive spreadsheet of all these ideas and that’s how we got started with Cashflow Cookbook. You can do them typically in an hour or less each and things that drive material amounts of savings and the key is things that really require little to no sacrifice, just a different way of thinking or an awareness of a better way of doing things. I think a lot of people wrestle with the idea of hey, how do I fit things into a budget? Where it can work against individuals is when they say okay, you know, I’ve budgeted X dollars for a monthly car payment and so with that head space you’re going to spend to the amount of that monthly car payment. What I’m saying is I think it’s good at least in addition in that to have a net worth statement, which is very simple, think of it as a wealth statement. What do you own and what do you owe? For example, if you bought a used car for $20,000 and you drive it off the lot, it’s still worth $20,000. If you borrowed that $20,000 against that car, your net worth wouldn’t change on that transaction. On the other hand, if you bought a brand new car and drove it off the lot, it would depreciate by 20% right away. You would now be driving a $32,000 car instead, but making the payments on a $40,000 car. If you’re thinking about what’s happening in your net worth, I think it changes your perspective on your finances in a positive way different than just doing budgeting. So, a little bit smarter thinking on the clothing and very significant savings, in that case it could be $800 or $1,600 of incremental money. Some of it could go to more clothes but some of it could go into debt pay down. At the end of the day, you would still have clothes you need, but with less waste, and more money saved. Enter in your location and it’ll show you a map of that area. It has little price tags of all the different monthly parking all around. So, in about a minute or so you could look at all the alternative parking…but that might be another $100 hidden right there. So that’s another example of something that we talk about in Cashflow Cookbook. With the help of his book, Gordon hopes his readers will start to analyze whether they can spend their money differently so they can save more cash. For more helpful tips on how you can make better spending decisions, without having to give up the things you like or need, tune in to our podcast or read the complete transcription below. Doug Hoyes: I’ve got a first time guest here on the podcast, we’ve got a lot of ground to cover so I’m going to dispense with the long introduction and get right to it, who are you? Gordon Stein: Well, thanks Doug, great to be here in the studio, I’m Gordon Stein. I wrote a book called Cashflow Cookbook and generated a lot of interest in Canadians on how to improve their finances. Doug Hoyes: Cashflow Cookbook, so how did you come up with this idea and maybe give us a bit of your kind of back story to – what gave rise to all of this? Gordon Stein: Yeah. So, my backstory engineering degree and MBA and a career in the high-tech industry, leading lots of large sales teams. And a subject that came up a lot was hey, can you help me with my personal finances, how do you make ends meet, how do you generate wealth? So, I always had a interest in personal finance and interesting Doug, the genesis of the book was I was in my car with a friend and he plucked a car wash receipt out of the console of my car and said, you know, why would you spend $13 on a carwash? And I thought it’s a carwash, not a big deal. So he talked about, you know getting an ESSO Extra card and saving the points and filling out a form and getting a carwash and it was just too much work to do so I didn’t see that as a great idea. And somebody had talked about getting one of their little speed pass payment dongles. And I thought that’s interesting, I can get the points, easier to pay for the gas and save $25 a month or so on carwashes and obviously not a big thing but it was just so easy, no sacrifice, got one for my wife, $50 a month. And then I heard the discount home alarm monitoring people on the radio and I thought oh that’s interesting, because that would be $25 a month cheaper, so there was $75. And then my engineering and business curiosity got the better of me and I started to build this spreadsheet of what are the rest of these ideas? How do you generate wealth, how do you save money to either pay down debt or put away for savings on things that require minimal sacrifice, minimal effort, are there more of them? And so that was a two year journey of building this massive spreadsheet of all these ideas and that’s how we got started with Cashflow Cookbook. Doug Hoyes: And I’ve actually seen the spreadsheet, it’s on the laptop here on our office in Toronto so it actually does exist. Explain to me what Cashflow Cookbook then means? Gordon Stein: Well, I wrestled initially I was going to write it as a novel. And I had all the characters developed and I had a free weekend cleared and the family was away and I thought I’m going to sit down and write this as a novel. And what I realized was there was so many ideas in Cashflow Cookbook and how do you put these into a novel, it just didn’t fit. And left the keyboard a little frustrated. And I just said under my breath I said this thing’s more like a cookbook. And the beauty of a cookbook is you don’t have to start at the beginning and read the entire book. You don’t have to go through the drudgery of a plot line and learn about the characters. You can go right to a section that’s of interest to you. So, you’re concerned about car expenses, you’re concerned about household expenses, there are a better way to handle lifestyle kind of expenses. You can find a recipe, which is the book code for one of these financial ideas and each one takes you through hey how much can you save a month if you’re a young millennial starting out, how much could you save a month if you’re someone of our age who’s got, you know, spouse and kids and cell phones and perhaps a cottage? Doug Hoyes: I’m 30 years old, I’m 30 years old if anyone’s wondering how old I am. Doug Hoyes: There you go. So you’re going from people who are younger to people who are older, it appeals to everybody. How many recipes are in the cookbook? Gordon Stein: So, I originally started out with 120 ideas and I whittled down the best 60 of them, 10 in each of those areas that we talked about, food and drink and household and so on. So there’s 60 in the book and in each book, each section of the book, each recipe starts with a little vignette where I do some character development and they uncover an interesting one time saving idea. So each of the main recipes are about a recurring month savings idea and then there’s almost a bonus incremental one at the start. Doug Hoyes: So it’s kind of like there’s 120 of them if you want to look at it that way. Gordon Stein: There’s 120 really interesting ideas. Doug Hoyes: Now I have not read the book. It’s sitting on the desk here and I will do that but of course probably most people listening haven’t read the book either. So, I understand about personal finance books I mean I’ve read them all and I actually wrote one and I’ll plug it at the end of the show. And a typical theme in personal finance books is well, you’ve got to make a sacrifice, you have to give up your coffee, or your latte, which is what we call coffees now, I don’t understand what a latte is but I think it’s a kind of coffee, it’s an expensive coffee. You have to give up your latte and that’s how you will get rich. That’s the secret to everything. So is that kind of what you’re talking about in your book, it’s a list of 60 or 120 things you have to give up and that’s how you’re going to be successful? Gordon Stein: Well, it’s interesting, most personal finance books they’re talking about there’s very conventional wisdom, you need to save 10%, you need to invest it, you need to pay off the bad debts and okay to incur some good debts and buy a house. There’s a whole set of dogma and it gets repeated many, many times in lots of these books. And one of the themes I totally agree is all about sacrifice and so the whole point of Cashflow Cookbook is as I said hey, what are the things you can shift and change that are easy to implement? You can do them typically in an hour or less each and things that drive material amounts of savings and the key is things that really require little to no sacrifice, just a different way of thinking or an awareness of a better way of doing things. Doug Hoyes: Which is kind of your car wash example. Gordon Stein: Exactly like that. Doug Hoyes: And instead of paying for a carwash, well if I’ve got the card that gives me the points and I get the carwashes for free then I’m not giving up the carwash, I’m just paying for it in a different way kind of thing. Doug Hoyes: And by the way if ESSO is listening they can sponsor this podcast because we just gave them a free plug. But I assume other car gas places have the same kind of deal so they – what you’re saying is look for something that you’re already doing and perhaps be getting it for a lower price. Now I flip through the book and – because there’s a Table of Contents where it’s all listed. And so I flipped through to page 64 and in this, and I’m not going to give the whole book away or I’m not going to give this whole thing away because people should get the book, but you’re talking about storage lockers. And so this is something that I see with my clients relatively frequently. Things are going pretty good, I’ve got a house, I’ve got a big apartment, I’ve got a lot of stuff and then nah, things are not going so well so I have to downsize. I have to sell my house, move to a smaller apartment but I’ve got all my stuff, maybe I go through a separation or divorce, so that’s the reason I’m downsizing, I’ve got all this stuff, what do I do? Well, I put it in storage. And I’m doing that as a temporary thing my clients tell me because, you know, I’ll be back on my feet and be able to then need all this stuff. Now I haven’t read the chapter so I don’t know what the answer is but tell me then about your thoughts on storage? I mean is it as simple as well, don’t put anything in storage or is it more nuance than that? Gordon Stein: Well, I find when you drive around in any city you see this proliferation of storage lockers and they are nicer and nicer and more and more of them coming up all the time, which says that people are making money on storage lockers. If you’ve ever tried to liquidate a house full of things perhaps you had a parent pass away or whatever, you need to move to a different city, it’s remarkable how little you can get for any of this stuff. So, many people will have to downsize after a divorce or after the kids have moved out and the surplus gear goes into a locker of course because you’re emotionally connected to this gear. But if you had to sell it, you probably could get less to nothing for it first of all and second of all if it didn’t work in the old house it’s probably not going to work in the new house either. And so people will be paying monthly storage fees at $400 a month for a storage locker and with things that maybe there isn’t even $400 worth in the locker so it’s worth taking a look at it. In Cashflow Cookbook what we do is we take a look at what’s the future value of making all these payments? So if you’re carrying one of these, you know, medium size lockers out for 20 years that would be a quarter of a million dollars that you’d be spending on the storage locker. That could be money that you could be using to be paying down debt. Doug Hoyes: So you’re doing the math as $400 a month times 12 months a year times 20 years? Gordon Stein: And I’m assuming you take that money and invest it at 7% or you’ve got to pay off debt that you would be paying 7% on. Doug Hoyes: Got you, okay. So I mean I understand you’re illustrating a point here no one is going to pay $400 for 20 years or earn exactly 7%, you know, maybe they’d earn if you’re paying down debt that’s 19% credit card you’re going to do a lot better than that if you’re you know, putting in a savings account where you’re putting in half of 1% it’s a different number. But your point is it adds up really quickly, that’s really the point. Gordon Stein: 100% and the beauty of Cashflow Cookbook being in cookbook format, you don’t have a storage locker, no problem, you skip that recipe and you’re onto the next thing. Doug Hoyes: Go onto the next one. So just to wrap up the whole storage locker thing then what exactly are you saying then, take a really hard look at what the stuff is really worth? And if you’ve got a 1,000 bucks worth of stuff that you could have a garage sale and sell for $1,000 or you could go to a garage sale and buy the same stuff for a $1,000 then keeping it in a $400 a month storage locker for anything more than two and a half months you’re losing money. Gordon Stein: You’re definitely losing money. So if it’s a temporary thing that’s great, if you know that you’ve moved out of one property and you’ve got another one lined up in three months, absolutely you put it in a storage locker. But a lot people do the downsize, do the change, they don’t think much of it, they put it in there and they’re paying the bills month after month. Doug Hoyes: Yeah and your example where, you know, perhaps a parent dies. Okay well, you know, they’re in a rented apartment, we got to give it back to the land lord we can’t take a year to figure out what we’re going to do with it so great let’s put it all in a storage locker, but there it sits for a year or two or three until we figure out what to do. So, take a very hard look at it, what’s it actually really worth and if there’s two or three items of high sentimental value, great bring them along with you or get a smaller storage locker or see if your buddy will store it in his basement or something but don’t incur that obligation that goes on forever and ever and ever. Okay, well that makes perfect sense. So again the book has – and that’s kind of one simple example that’s not the cornerstone of the book. Like I said I flipped to page 64 so there’s a whole bunch of other stuff in there. You’ve also got a blog and what’s the address of your website, your blog? 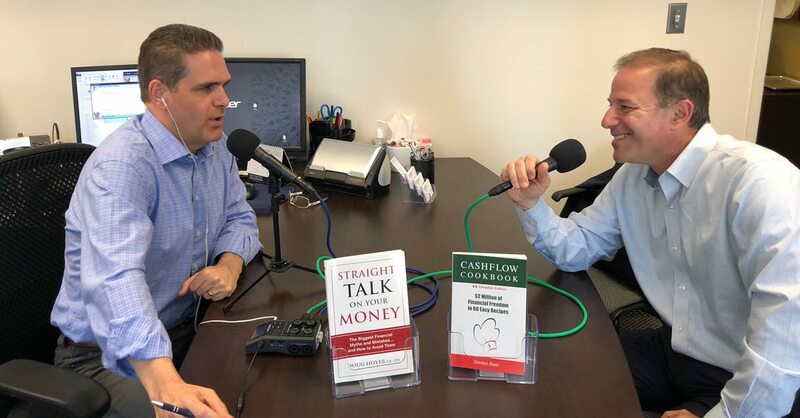 Doug Hoyes: So, cashflowcookbook.com, all one word. And you had a post in there on budgeting being the problem. And I’m kind of paraphrasing what the concept was there. Explain what you were getting at with that post, what’s your view of budgeting? And listeners to this show know that I have some very definitive views on budgeting so I’ll either agree with you or trash you after you – so, I’m setting you up here to be slammed if we disagree but that’s the beauty of having my podcast I can do whatever I want. So, tell me your theory of budgeting? Gordon Stein: Well, I think – I don’t think there’s anything intrinsically wrong with doing some budgeting, I think it’s really important to understand how much you’re spending and what you’re spending it on. I think a lot of people wrestle with the idea of hey, how do I fit things into a budget? Where it can work against individuals is when they say okay, you know, I’ve budgeted X dollars for a monthly car payment and so with that head space you’re going to spend to the amount of that monthly car payment. What I’m saying I think it’s good at least in addition in that to have a net worth statement, which is very simple, think of it as a wealth statement. What do you own and what do you owe? And you set that up in a spreadsheet going on in time so you can say is my net worth, my financial net worth, is it actually increasing over time or is it not increasing over time? So you could be leasing a car for $561 a month, it fit into your budget because you can afford that. But if you look at what’s happening in your net worth, you know, the car’s a declining asset, it’s going to be lowering in value so could you have done something differently in transportation that would help your net worth? So if you’re thinking about what’s happening in your net worth I think it changes your perspective on your finances in a positive way different than just doing budgeting. Doug Hoyes: So that’s an interesting comment. So you just said think of, and now I’ve already forgotten what you said, but it was think of what the effect is on your net worth. Okay and that’s not really what we do is it? We think of what’s the effect on my budget? Gordon Stein: Right. You think of how it looks in the month but there could be a world of difference there. So for example, if you bought say a two year old used car for $20,000 you drive that one off the lot and the day you drive it off the lot it’s still worth $20,000. So if you borrowed $20,000 against that car, your net worth didn’t change on that transaction. If you bought a brand new car, you drive it off, it’s going to depreciate by 20% so the payments are going to stay the same you owe that $40,000 on the new car but, you know, when you get off a lot you’ve lost 20% of it, you’re driving a $32,000 car. Doug Hoyes: So the concept of net worth is a long term concept. The concept of my monthly budget is obviously by definition a short term concept. Doug Hoyes: So let’s go back to the storage locker for example. Well, okay it costs me maybe well a small one’s only $200 a month, a larger one maybe $400 a month. Okay, in the grand scheme of things it’s not that much money. But what you’re saying is well, multiply it out by more than a month or two, multiple it out by 20 years. Okay and maybe that’s a silly example, I’m not going to keep it for 20 years but okay, multiply it out by three or four and you’re also bringing in the concept of opportunity cost here too. Gordon Stein: Absolutely. So if you take something like, you know, we’re beating up a lot on storage lockers, there’s lots of different ideas in the book, we can come to some other ones. But that particular example, let’s take that $400 a month you’re spending on this storage locker, let’s sell the gear if it’s only worth $400, maybe it’s worth 1,000. Let’s sell it and let’s take that $400 a month and let’s say you’re carrying high interest credit card debt and let’s start paying that down with that $400 a month. That’s a really material difference particularly if you’re paying 22% on the credit card debt. So, small change like that, nothing really changed, you didn’t even see this gear that was away in a locker but now you’re meaningfully paying down the debt. Doug Hoyes: Yeah not only are you getting some cash up front but you’re also saving going forward. So, is it fair to say then that you are more focused on better decisions and lifestyle change sort of good habits as opposed to tracking numbers? Gordon Stein: Yeah, I think well in Cashflow Cookbook at the end of each recipe there’s a [light] example for perhaps a single person with a car and an apartment and what I call a hearty example which would be, you know, married, kids, we talked about that. And it has a tracker on there so you can say hey, what would my numbers look like on the storage locker on clothing, on medications, pharmaceuticals, all the different things that are in the book, entertainment lifestyle. And what would that be worth to me over 10, 20 years and all the maths in there? So you can say hey, here’s where I’m going to be when I get to retirement or here’s where I’m going to be where I can have more opportunity because I have more options because I’m in a much better financial footing. Doug Hoyes: So it’s a much more long term view, that’s really what you’re emphasizing here. So, okay well this podcast is called Debt Free in 30 and obviously we talked about debt and you’ve already hit on sort of some peripheral things here. So for someone who is in debt and, you know, having a tough time managing money, how do you help them rethink their approach to finances? You know, maybe another way of asking that question is what do you think the biggest obstacle is for people when it comes to money? Gordon Stein: Well, I think those folks who are in a debt situation I think, you know, that can be a powerful, powerful force in a life. So I think obviously important to get out of debt, get on a firm financial footing and release all the pressure and anxiety that comes with that. But the challenge is always we talked about it earlier a challenge is always sacrifice, hey you don’t want to give up things, you want to solve this debt problem but you’ve got a lifestyle, you’ve got things you enjoy. Doug Hoyes: Yeah and that’s certainly a discussion I have with my clients that okay, so I mean my typical client would have a significant amount of debt, that’s why they’re coming to see me. It’s not like they owe a couple of thousand bucks and okay well give up coffee for a couple of weeks and you can pay it off kind of things. My typical clients has 30, 40, 50, $60,000 worth of debt and it’s accumulated over a long period of time and there’s often been life challenges. They’ve gone through a separation or a divorce, they’ve lost their job, they’ve gotten sick and they haven’t been able to work. They’ve used credit to survive. So, they’ve got this massive amount of debt. And so in a lot of cases you’re right, their only choice is to file a consumer proposal. There’s – you can only give up so many storage lockers. You know, if your shortfall is $2,000 a month because that’s what all your minimum payments are then giving up your $400 a month storage locker ain’t going to do it. But once the debts are taken of so it may be that yes, okay we have to file a consumer proposal, it’s going to cost 200, 300, 400, $500 a month, how do I fund that? Well one of the answer is taking a look at where you’re spending your money now and seeing where it can be, you know, eased back. And the examples in this book are applicable. Like I mean as you say every one isn’t going to be applicable to everyone, there may only be four or five that are perfectly applicable to you, but these are not all examples for rich people. It’s not like well if you give up your second yacht then everything will be – I don’t know if that’s one of the examples. Gordon Stein: That’s not in there, there’s no second yacht. Doug Hoyes: You can put that in the second edition maybe. So, you know, what are some examples, and you’ve already given us one where we talked about storage lockers, I guess there won’t be a storage locker company sponsoring this broadcast but what are some other examples of things that people, we’re not talking rich people, we’re talking the average person could do to, you know, implement some of the wisdom here so there are ways that they can save money. Gordon Stein: Yeah I mean there’s so many across so many different areas but I’ll give you a couple more. In the financial section of the book one of the ones that’s quite interesting is mortgage life insurance. So, when people get a mortgage, typically the couple is there if it’s a couple buying a house and the question hey, what happens to your spouse here if you should become disabled and not able to make the payments? We should protect that. The answer’s yes and that leads to a discussion about mortgage life insurance. And that seems like a really logical thing to do because relative to the mortgage of $2,300 a month or $1,800 or whatever it is, paying another 60 or 70 or $80 for mortgage life insurance seems like a really good idea. Doug Hoyes: Yeah and the theory being we’re together, if I die my income isn’t there anymore, how are you going to make the mortgage payment? Well if we have mortgage life insurance then I assume the concept is that just pays off the mortgage. So this is great, we’re all sad that I’m dead but the mortgage is paid off. It sounds like a perfectly logical thing, obviously you don’t think it’s perfectly logical. Gordon Stein: Well, it makes total sense and the premise itself is a great idea, you absolutely want to protect the family from that liability should the principle breadwinner pass away. But what’s interesting thing is you can go and get term life insurance from an insurance company and that can be in the neighbourhood of a quarter or a fifth of the cost. And what’s interesting is when you get it from a life insurance company you’re ensuring the full amount, let’s say a half a million dollars and you carry that half a million dollars of life coverage for the rest of your life for as long as you pay the premiums. In the case of mortgage life insurance what you’re getting declines as you pay off the mortgage. So the last month you’ve got one payment left of $2,000 with mortgage life insurance, you’re paying the same $80 you always were but you’re only insuring $2,000. Doug Hoyes: Got you, so when I first buy my house, I mean we’re sitting here recording this in Toronto so I guess the average mortgage is 10 million dollars or whatever it is these days. So let’s say my mortgage is $500,000 I go and I – mortgage life insurance is a product that the mortgage place will sell you, the bank. Doug Hoyes: And so this is a way for them to make some extra money. So they say okay, your mortgage is $500,000 here’s what the premium is on $500,000. It’s I don’t know what the number is you said $60 a month, we’re just making up numbers here and it’s always $60 a month then. It’s not going to be $58.12 next month because I started paying down my mortgage. So five years from now when my mortgage is down to $400,000 I’m still paying the same $60.000. Doug Hoyes: And what you’re saying is so go out and get life insurance and you’re talking about term life insurance. Gordon Stein: Term life insurance, yes. Doug Hoyes: And what’s the other kind of life insurance, other than term? Gordon Stein: Whole life insurance. Doug Hoyes: And what’s the basic difference? Gordon Stein: Well, like it’s far more complicated, like there’s an investment component to it but what you’re really doing is just protecting that. Doug Hoyes: So term life insurance is just like car insurance, I pay for it at the end of the year I pay for it again if I didn’t die or if I didn’t crash my car then the money’s gone but I paid a lot less than if I’d built up some kind of investment with it. So with term life insurance I go to my life insurance agent and I say I want $500,000 worth of insurance and they say okay, great we’ll get you this policy, it’s term insurance so you can cancel it any time but the premiums are locked in for five years or 10 years or 20 years or whatever so I’ve always got the $500,000. Gordon Stein: That’s right. So you’ve got better protection and you’re paying about a quarter as much, so back to our idea of how do we pay down some debt? Not unusual depending on the size of the mortgage and the age and smoking, non-smoking and everything else. But not unusual to be able to save 70, 80 even up to $200 a month by getting this term life insurance in place of the mortgage life insurance, better protection and now we’ve got another 100 or maybe even $200 that we can use to repay our debt. And like the rest of Cashflow Cookbook there’s no sacrifice there, not more difficult to do, that’s a phone call and it’s another piece of significant savings. One quick idea probably an hour to implement and it might be 100 or $200. Doug Hoyes: So better protection, lower cost and there’s no sacrifice so that’s kind of like a no brainer. Gordon Stein: That’s the way the whole Cashflow Cookbook is written. Doug Hoyes: That’s the whole shtick here, it’s a no brainer. And I guess the reason we get mortgage life insurance from the bank is it’s kind of the last thing they throw at you and you’re about to buy your house and sign all the documents and they say oh well, you don’t want to die and leave your spouse with the debt, why don’t you just sign here and we’ll take care of that and I don’t actually think to shop around and look at something different. Gordon Stein: Yeah. And again the premise, is a great idea. You do want to protect your spouse, you absolutely want to have the coverage but let’s do it in the most efficient way that we can. Doug Hoyes: Yeah, save some money doing it. Doug Hoyes: So okay you said you had two examples that was one of a way to save money and obviously in the book there’s way more so throw us one more. Gordon Stein: Yeah. A really interesting one that I discovered, we all like to buy nice clothes and great to have nice clothes and let’s not make any sacrifices there. But a really interesting stat that comes up time and time again is that we only ever wear 20% of the clothing that we buy, which is quite remarkable. And if you actually go through your closet and when you do the spring clean out to get ready for the annual yard sale, it’s always astonishing how much clothing you throw out. And if you take a look at what you’re not throwing out but selling in the yard sale, a lot of it you’ve never worn. And what’ll happen is hey, it was a great deal, it’s a little too tight in the waist but it’s a great deal I never really liked the colour but it’s a designer one so I bought it anyway. Doug Hoyes: Are you saying I’m fat Gord, is that what I’m reading here? But I hear what you’re saying and it sat there for a long period of time. Gordon Stein: Yep. And so if you look at that typical clothing budget that people spend, you know, let’s say you spend $1,000 a year on clothing if you’re only wearing 20%, which is $200 worth and then the other $800 is going to go in the yard sale at maybe 5 cents on the dollar so there’s no sacrifice here but what it is, is it’s about taking the extra moment to try it on, does it actually fit, does it actually look good? Is it a piece that you need? So are you out buying another pair of black shoes when you have three pairs of black shoes but your brown belt is orphaned because you don’t have any brown shoes to wear with it. So, a little bit smarter thinking on the clothing and very significant savings, in that case it could be $800 or $1,600 of incremental money. It could go into more clothes, some it could go to more clothes but some it could go into this debt pay down. Doug Hoyes: Well and you’re right when you go to the clothing place and they’ve got the two for one sale okay, well if I didn’t buy the second one is the first one cheaper? Like is it really two for one or is it really 50% off? Can I save money that way? So okay I think the two themes I hear here are number one think and number two look at the long implications as opposed to just the monthly implications. And back to your comment on budgeting yes I think your thinking aligns with mine so we don’t have to – I don’t have to trash you on it. So okay so final comment then we talked about coffee and lattes before the thing started and so I have to ask every personal finance guest what their theory is on this. Okay so what I got to give up coffee? What’s your approach on something basic like that? Gordon Stein: Well, I think the first thing to do, and we all love coffee, I think the first thing to do is look at what is your actual spend look like? We were chatting earlier I talked about a co-worker that I had, this particular person, you know, two big Starbucks lattes in the morning and can of coke, bag of chips in the afternoon. And what was remarkable in that case is that the company that we’re talking about they actually had a full blown bean grinding Starbucks machine right there in the office and she still went out to get two more coffees. You do the math on what she was spending it would be enough to lease a Honda Civic, it was over $300 a month on her total spend. So, there again hey here’s money that could have gone into leasing a vehicle, could have gone into debt pay down and minimal sacrifice because the office already had great coffee, she never even tried it. So some different ideas like that. Other ones you could look at I’ll just toss you one more that was really interesting. Most office buildings a lot of people don’t get their parking paid for and if you have to drive in a city like Toronto you’re often in a situation where you have to drive. Well, where would you park? Well the obvious answer is you park underneath the address of where your office is. But if you just took a minute to take a look at hey, what are the other parking rates around here? There’s people who pay the daily rate every day for years. There’s a website called Best Parking and enter in your location and it’ll show you a map of that area, it has little price tags of all the different monthly parking all around. So, in about a minute or so you could look at all the alternative parking, maybe it’s 100 yards away from your office, most of us could use the extra 100 yard stroll in the morning. But that might be another $100 hidden right there. So that’s another example of something that we talk about in Cashflow Cookbook. Doug Hoyes: And which is why I guess you have to look at what you’re actually spending to then analyze whether it could be done differently. And your example of parking is good because again we’re recording this at my office in Yonge and King in downtown Toronto and parking is as expensive as anywhere here obviously. I mean at our Kitchener office we park for free and it’s no big deal but down here there’s no such thing as that. And of course most, you know, a lot of people are taking public transit but you’re right there are some times when you’ve got no choice, you’ve got to drive and you don’t think about that well, why don’t I survey all the buildings around and I mean here in Toronto we’ve got the path system, you can walk underground anywhere anyway so it’s not that big a deal. But you’ve got to actually step back and think about it. That’s really what it comes down to. Gordon Stein: Yeah that’s what it is and it was two years of gathering the best of these ideas and consolidating them into Cashflow Cookbook. So, you know, with the value of the book you can go through, you can start at the index and say hey, this doesn’t work, that doesn’t work, wow I hadn’t thought of that, that’s interesting. Like the parking example, the storage locker, the clothing and there’s 120 really in total in the book. Doug Hoyes: Excellent. Well, I think that’s a great place to end it. How can people find both you and the book? Gordon Stein: Best way to start is if you go to cashflowcookbook.com. You’ll see the blog, there’s articles, there’s what I call utensils, there’s a lot of bad cooking puns through the whole thing Doug. And you can read the latest blog post, you can sign up to get them and of course you can get Cashflow Cookbook there, Cashflow Cookbook also available in paperback and as a kindle edition on Amazon. Doug Hoyes: Excellent. So there you go, you can get it as a paperback or Kindle, cashflowcookbook.com is where you can find it, Gord, thanks for being here today. Gordon Stein: Oh a real pleasure, thanks so much Doug. Doug Hoyes: Thanks for being here. That was Gord Stein, the author of Cashflow Cookbook, two million dollars of financial freedom in 60 easy recipes. And again you can find more at cashflowcookbook.com. Now Gord you’ve also – you’re on Twitter. How do they find you on Twitter? Gordon Stein: On Twitter you can follow me @cashflowcookbk. Sadly there’s a limit on how many letters so it’s cash flow cook and then abbreviated bk, abbreviated book and also on Facebook Cashflow Cookbook with the O’s in there. Doug Hoyes: Excellent. Well, as always you can find show notes and a full transcript at hoyes.com and I’ll include links to everything Gord just mentioned so that you can find Gord and Cashflow Cookbook, find him on Twitter, find him on Facebook. So Gord, thanks for being here, to everyone else thanks for listening. Until next week, I’m Doug Hoyes. That was Debt Free in 30.